I recently came into a couple new Garbage Pail Kids Cheap Toys figures to add to my paltry collection and immediately started thinking of how I might photograph them to properly show how fun and cool they are. When I stumbled onto an old Topps Garbage Can-dy container I had lying around (in a nice silvery gray color), I knew I found the answer! 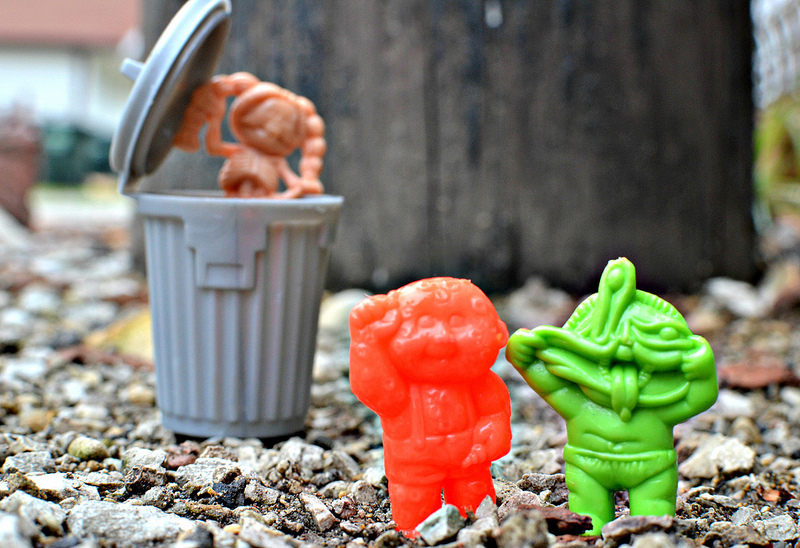 GPK figures and Garbage Can-dy containers are a match made in toy heaven (or in this case, the alley). Now, if I could only go back in time and buy a considerable amount more when they were literally cheap toys! Great Pic! All the different colors and plastic variations available in Cheap Toys is what got me hooked. The Garbage Candy containers are great, and they go along perfectly with the toys. There's blue, red , yellow, and green containers that match with the Series 2 cheap toy colors almost perfectly! Thanks, Jackson. The color and plastic variations definitely make this line very appealing. I just wish I could find more of the neon ones. Those are my favorites!